Until now, there has been very little research into why young Kenyan and Somali men join al-Shabaab and the Mombasa Republican Council (MRC). This has led to limited understanding among government and Kenyan society of the roots of radicalisation and terrorism. But to deal with terrorism you have to know where it comes from. I recently concluded independent academic research, in two different studies in Kenya and Uganda, followed by a third study in Somalia in partnership with Finn Church Aid. In the Kenyan research, with the assistance of the Kenyan Muslim Youth Alliance, we interviewed 95 people associated with al-Shabaab, 45 associated with the MRC, and relatives of people associated with the organisations. We found that many Muslim youths joined extremist groups as a reaction to the Kenyan government’s collective punishment or assassination of their religious leaders. It is clear, therefore, that government anti-terror strategies based on mass arrests and racial profiling are counterproductive and may drive individuals to extremism. Unless government changes its approach, there is a real risk it will inspire a new cycle of radicalisation and violence. The MRC is often mistakenly associated with al-Shabaab, but our research showed very clear differences in the type and motivation of people who join the two organisations. The MRC is driven by ethnic and economic factors, while al-Shabaab’s core is radical Islam. The two have a common enemy in the Kenyan government, but it would be a mistake to place extremists from both groups under one banner. Violent extremism in Kenya has since the 1990s lost its exclusively foreign character, and national and regional extremism has expanded. While al-Shabaab’s roots are in Somalia, growing acceptance of al-Qaeda and al-Shabaab’s philosophy in traditional African communities has allowed it to spread through the broader region, including Kenya. The most dramatic manifestation of al-Shabaab’s abilities to strike beyond Somalia came when it successfully executed suicide attacks in Kampala, Uganda, on 11 July 2010, and the attack on the Westgate shopping mall on 21 September 2013 in Nairobi. Al-Shabaab was also implicated in smaller attacks where Kenyans were the targets of improvised explosive devices and hand grenade attacks. In addition to being the victims, Kenyans and Ugandans were directly involved in recruiting their fellow nationals to join al-Shabaab, some of whom were used to execute attacks in their own countries. These radicalised individuals are identifying with something other than being Kenyan. It shows that radicalisation will increase as long as Kenyan citizens identify with an ethnic or religious identity that is perceived to be under threat. The assassination of Muslim leaders or scholars has radicalised and recruited dozens, if not hundreds, of people into extremist organisations. It is not only government and its security forces that treat people on the fringes of society as the ‘enemy,’ but also broader Kenyan society, which perceives al-Shabaab as consisting only of Somali nationals or those who are visibly Muslim. Unfortunately, Kenyan government officials have to date mostly denied that domestic circumstances contribute to the radicalisation of Kenyan nationals. Some consider Kenya to be an innocent victim of conflict between the United States and Islamic extremists, or think that Somalia is the beginning and end of all its security problems. Only a few accept that Kenya is experiencing internal problems. Security in Kenya is also increasingly politicised, which affects the government's response to terrorism. For example, following the killing of at least 15 people in the village of Poromoko near Mpeketoni on the Kenyan coast on 15 June 2014, President Uhuru Kenyatta blamed official political opponents, even though al-Shabaab accepted responsibility. Instead of attempting to bring people together, politicians are harnessing political divisions for their own ends, which further threatens national unity. As a result, the Kenyan leadership has not stepped in to address growing radicalisation when firm action could have prevented the increase in attacks. Instead, local conditions have enabled growing frustrations to become worse, enabling al-Shabaab to strengthen its foothold in the country. During our study, most al-Shabaab and MRC respondents said what pushed them to finally join radical organisations were injustices at the hands of Kenyan security forces. People interviewed specifically referred to a perception of ‘collective punishment’. The single most important factor that drove respondents to join al-Shabaab, according to 65% of respondents, was government’s counter-terrorism strategy. The worst example of a campaign of mass arrests came in April 2014, when Kenyan authorities arrested 4 005 Somali-looking individuals. But lashing out against the collective is ineffective and counterproductive, because a real danger exists that affected communities might see the need to defend themselves, thus driving individuals to extremism. Our research also looked at the role of religious identity in radicalisation. Despite Kenya being a secular country, Muslims feel discriminated against and are not well represented in key government positions and institutions. Revealingly, 73% of al-Shabaab respondents said they ‘hated’ other religions. Asked to define the intensity of the conflict between Islam and its enemies, 74% of respondents classified it as ‘ongoing’ and 26% as an ‘all-out war’. Nearly half of al-Shabaab respondents (49%) identified the government as the source of the threat to their religion, followed by other religions (24%), an ‘external enemy’ (18%) and a combination of the government and others (9%). The role of religion was again confirmed when respondents were asked why they joined al-Shabaab – 87% of respondents cited religion. None of the MRC and only 1% of al-Shabaab respondents indicated that they trusted politicians, yet 22% of MRC respondents still believed that elections could bring about change. Only 4% of al-Shabaab respondents had the same trust in the political process. It is clear that politicians and government face a serious legitimacy crisis among individuals who joined al-Shabaab and the MRC. Government needs to create the necessary space to permit the expression of political frustrations and interests other than through the use of violence. Education or a lack thereof was identified as a crucial contributing factor to relative deprivation. Overall, al-Shabaab respondents were better educated than MRC respondents. The number of years a person spent at school is therefore not the most important factor in preventing later radicalisation – it is also the quality of education that determines its value in preparing a person for a career. 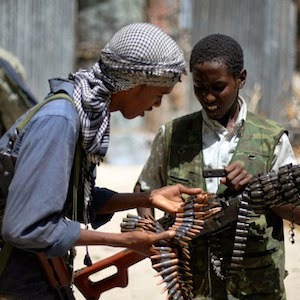 More than half of respondents joined al-Shabaab and the MRC between the ages of 10 and 24. Nearly all al-Shabaab (96%) and MRC (87%) respondents said they had high levels of frustration when they joined the organisations, illustrating the role emotions play in the radicalisation process. Most al-Shabaab respondents (87%) referred to religion or the need to respond to a threat to their religious identity as their motive for joining. Only 4% of al-Shabaab respondents referred exclusively to economic reasons. MRC respondents were motivated by a combination of ethnic, political and economic reasons. By contrast, economics were a much larger factor in recruitment to al-Shabaab in Somalia, where researchers interviewed 88 former fighters in Mogadishu in April 2014, in a separate study by the ISS and Finn Church Aid that used the same methodology as the Kenya research. This article first appeared in the East African and Daily Maverick.